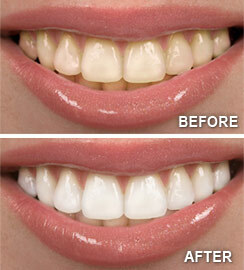 This technique offers the fastest results with the most powerful whitening solutions available. First, we will cover your gums and tooth-root surfaces with a protective barrier to ensure your safety. A thin plastic device known as a retractor will hold your lips and cheeks away from your teeth as we apply a professional-strength hydrogen peroxide gel, which we will leave on for about an hour. When we remove the gel, the results will be obvious immediately.Teeth whitening done in a professional dental setting is a safe, effective way to brighten your smile. It's also perhaps the most economical cosmetic dental procedure. Depending on the whitening method you choose, results can be dramatic: in-office whitening, for example, can lighten teeth three to eight shades in a single hour.